"I hope showing photos like this lets mothers know they're not fighting their battles alone." 10 tricks for getting the kids out the door faster each morning. "Have kids ," they said, "they're so much fun!" 'They' were mostly right. But we all know that the more kids you have, the messier the house becomes and the more chaos surrounds us. Jazmyne Futrell, 31, from Victorville, California posted an image of herself surrounded by her beautiful children in her kitchen. 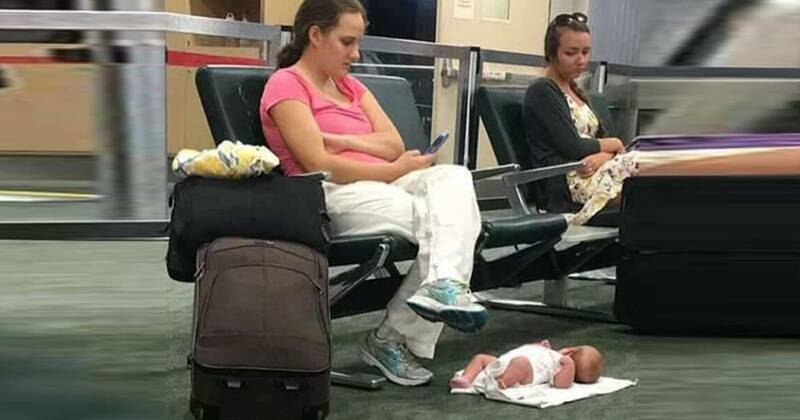 The image, which was posted to the page, Mixed Mom Brown Babies , has since gone viral, no doubt due to its relatability to parents around the world. Mary basically says not even Usain Bolt stands a chance against a toddler who spots the nappy cream or a mug they've not yet broken. "Tinned throat vs Steel jaw." Image: Instagram/mary_chemi. Friends with no kids: "you go to bed at 9pm? Girl I can't fall asleep before 11pm." Mum friends: "you go to bed at 9am? Girl I can't seem to stay up past 8:30." With four kids I'm way too exhausted to even think about having a life after dark and way too busy to go to bed at a decent hour. What's your bedtime? Do you have a nightlife or are you in the bed before the sun? The photograph, taken by Futrell's husband, shows the mum in her kitchen with their four children. She's at the stove, cooking dinner while breastfeeding seven-month-old Koehn. Tugging at her shirt is seven-year-old son Karson, by the look of things asking for help with his homework. And finally, five-year-old Kinley and and three-year-old Karter are playing around her on the floor. "There's not enough realness on social media"
Futrell told Yahoo Lifestyle she shared the image to add some realness to the fake images on social media. "I shouldn't be cooking while holding my baby, my son has a ponytail because I didn't have time to braid his hair, and my kids are on the floor," she said. "That's why I posted it — there's not enough realness on social media." Futrell, who also suffered postnatal depression, hoped by sharing the image, she helps other women feel less alone. We're going to ignore the unhelpful comments suggesting she should have stopped at two kids, but focus on the positives. "I have four kids too and I'm lucky if I'm in bed by 10pm to be up at 5!" commented one person. Another hailed Futrell for her coordination: "You are so coordinated! I could not get myself a cuppa tea when breastfeeding." One simply wrote, "You go, girl!!! You're killin it!" And she certainly looks like she is. What time do you get to bed these days?